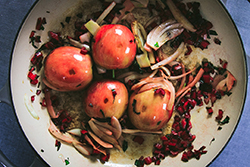 This dish tastes just like autumn! 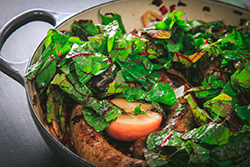 An easy to prepare dinner, simply sauté a few aromatics, soften some apple halves, brown the sausages, and sneak in a few greens for a complete and hearty meal. 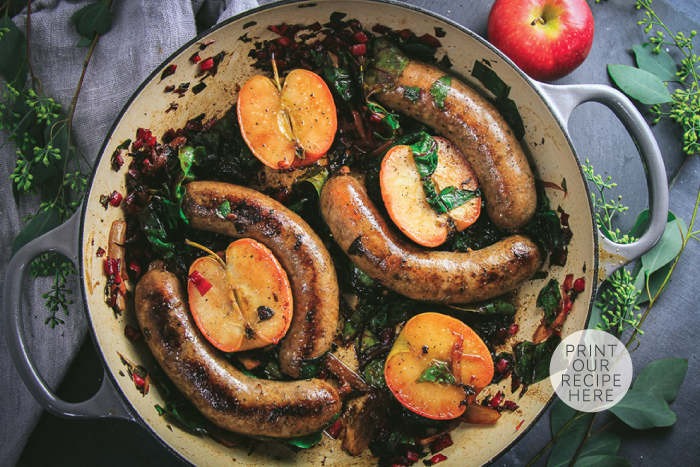 We loved how the savory spices of the sausages paired with the warm, soft apples - very satisfying indeed! 1. Heat the olive oil in a large skillet or braiser over medium-high heat. 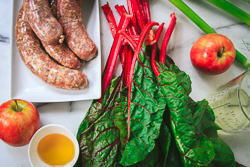 Add the apple halves, fennel, and diced chard stalks and sauté, turning occasionally, until golden brown, roughly 8-10 minutes. 2. 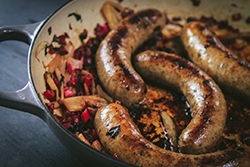 Pierce the sausages with a fork a few times, and add them to the pan. Sear the sausages, turning occasionally, until browned on all sides. After a few minutes of searing, add the wine and vinegar. Continue to cook the sausages until they are done, continue to cook and brown the sausages, as needed until all sides are golden brown. 3. 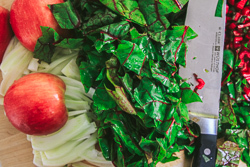 Add 1/2 cup of water and the chard leaves to the skillet, and quickly wilt the chard. Sprinkle with salt and pepper and serve immediately.